Mayor Rahm Emanuel presides over the Chicago City Council meeting on Wednesday. The plan to revamp the city's system of investigating police won approval Wednesday. Demonstrators in Chicago march down Michigan Avenue on Nov. 25, 2015 in response to the release of a video showing Chicago Police officer Jason Van Dyke shooting and killing 17-year-old Laquan McDonald. The police oversight agency investigates police misconduct cases, but after the Independent Police Review Authority reviewed hundreds of cases and rarely found the police officers at fault and last year's release of a video showing a white officer fatally shooting a black teenager caused national uproar, the agency is getting an overhaul. The video showed Chicago police officer Jason Van Dyke shooting 17-year-old Laquan McDonald 16 times. The case prompted big changes including the murder charges against Van Dyke, an investigation by the Justice Department and the city's internal effort to police the department. Chicago Mayor Rahm Emanuel says there have already been a lot of improvements made to help keep officers accountable. "From body cameras, to tasers, to different types of training in de-escalation," Emanuel said. "I think what we're doing as it relates to the training is significant. I happen to think the policies we've done as it relates to the video is significant and we will continue to make improvements in the never ending quest of what I consider community policing." The new agency, the Civilian Office of Police Accountability, will have subpoena power. The city also created a new position for a deputy inspector general who will keep tabs on the agency. Although the city just approved the agency and new deputy position, Emanuel has worked on the reform plan for months. Changes, like new restrictions to when police officers can serve as investigators, have happened along with public hearings and meetings with aldermen and community interest groups. Both the police union and community groups have issues with these restrictions. While the union doesn't like the measure, members of the community say the measure doesn't go far enough in fixing the issue and leaves Emanuel with too much control over appointments. Emanuel's delay of creating a civilian oversight board until next year is what critics are more frustrated about and part of the reason why protesters took to city hall. The group chanted "hold the vote," in an effort to persuade aldermen to wait before voting on the agency. Curtiss DeYoung heads a faith-based group and says there has been little community engagement in the reform process. "Our commitment is that the community be able to vet what's happening so that trust can be built, rebuilt, between our mayor, our aldermen, our police and the community, and so, with this lack of transparency in what's going on, we say give us another month," DeYoung said. While the measure to approve the agency passed 39 to 8, not all aldermen are in favor. Alderman Leslie Hairston voted against the agency's approval saying she's not sure it will have enough funding or independence from city hall. "This was our chance to get it right the first time — before the U.S. Department of Justice tells us to start over again," Hairston said. "Obviously, Chicago ain't ready for reform." Other aldermen, along with Emanuel, support the agency and acknowledge that while it's not perfect, it's a step in the right direction and there will be more reforms to come. Some of these reforms might be mandated by the U.S. Department of Justice once it's investigation of the Chicago Police Department is complete. Videos of fatal shootings by police have caused cities to rethink how they investigate allegations of officer misconduct and excessive force. 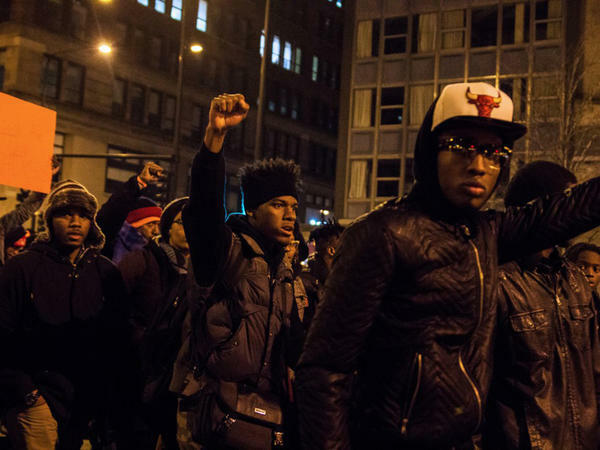 In Chicago, the city council just approved a new police oversight agency. And this is the latest effort to heal a fractured relationship between police and residents, but critics say the new agency doesn't give community groups much of what they wanted. Here's NPR's Cheryl Corley. CHERYL CORLEY, BYLINE: There are a couple of reasons why the agency that investigates police misconduct cases in Chicago is getting an overhaul. First, in hundreds of cases, the Independent Police Review Authority, or IPRA, rarely found police at fault. And second, last year's release of a videotape showing a white officer fatally shooting a black teenager caused a national uproar. UNIDENTIFIED PEOPLE: Sixteen shots and a cover-up. UNIDENTIFIED CROWD: Sixteen shots and a cover-up. CORLEY: The video showed Chicago police officer Jason Van Dyke shooting 17-year-old Laquan McDonald 16 times. It prompted big changes, including murder charges against Van Dyke, an investigation by the U.S. Justice Department and Chicago's own effort to police its police. Mayor Rahm Emanuel says the city has already taken several steps to change the way the police department works. CORLEY: And now a new police oversight agency called the Civilian Office of Police Accountability, which will have subpoena power. The city also created a position for a new deputy inspector general to keep tabs on the new agency. Emanuel's police reform plan has been in the works for months. There have been public hearings, meetings with aldermen and community groups and changes like new restrictions on when police officers can serve as investigators. The police union doesn't like the measure and neither do some community groups who say it doesn't go far enough and leaves the mayor with too much control over appointments. UNIDENTIFIED CROWD: Hold the vote. Hold the vote. Hold the vote. CORLEY: So demonstrators at City Hall, chanting hold the vote, tried to persuade aldermen to do so. What has riled critics the most is a decision by Emanuel to delay creating a new civilian oversight board until next year. Curtis DeYoung heads a faith-based group and argues there's actually been very little community engagement. CURTIS DEYOUNG: Our commitment is that the community be able to vet what's happening. So that trust can be built - rebuilt - between our mayor, our Alderman and the police and the community. And so with this lack of transparency in what's going on, we say give us another month. CORLEY: Instead, Chicago aldermen voted overwhelmingly yesterday for the Emanuel plan. That vote comes as other cities like Ferguson, Mo., St. Louis and Newark are instituting similar reforms. Chicago alderman Leslie Hairston voted against the plan because she worries the city's new police accountability agency won't have enough funding or independence from city hall. LESLIE HAIRSTON: This was our chance to get it right the first time before the U.S. Department of Justice tells us to start over again. Obviously Chicago ain't ready for reform. CORLEY: But Mayor Rahm Emanuel and the majority of aldermen who supported the new oversight agency say while it's not perfect, it's a step in the right direction, and there will be more reforms to come, some of them perhaps mandated by the U.S. Justice Department once its investigation of the Chicago Police Department is complete. Cheryl Corley, NPR News, Chicago. Transcript provided by NPR, Copyright NPR.